Kahuna Wahine Ali'i Nui Kalei'iliahi is a kanaka maoli (aboriginal) of Hawai'i. She carries the royal blood of a pure Lemurian and comes from a long line of Spiritual Kahuna (priest/shaman) and Ali'i (chiefs/chiefesses). Among the gifts she carries as Ambassador to the Ancients is that she is a seer, medium, meta-physician, spiritual healer, Keeper of the Lemurian Truths and channel for many magnificent Holy Beings. 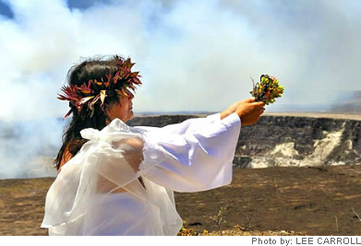 Kahuna Kalei'iliahi has worked with people both on island and worldwide, spreading her mana (divine energy) and doing her sacred ceremonies and spiritual readings. She lives with her husband Lopaka on the Big Island of Hawai'i. For every problem there is a spiritual solution, for every challenge there is an answer…with your name on it. There are legions of Angels, a multitude of Holy Beings, all around you and they are here in service to you. You come in with them from birth and with your Soul's permission they speak to me on your behalf. They are here to guide you to your highest good, to the solutions with your name on it …for you are loved beyond measure. I am a High Priestess with gifts I carry from my Hawaiian and Lemurian lineage. It would be my honor to be their messenger for you. The Webster dictionary defines the word integrity as 'the quality or condition of being whole or undivided'. And such are we in our natural state as our most Sacred Creator created us ... all part of the whole, all ONE. 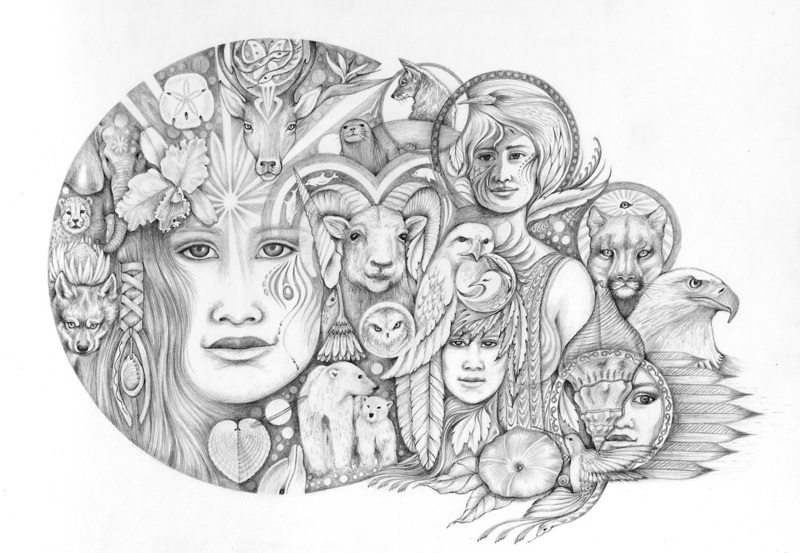 This drawing is a fluid expression of our natural state, it is filled with the 'mana' or Spiritual power of the Artist Kahuna Kalei'iliahi and offered in love to the world.